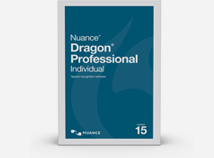 Dragon® Professional Individual can save time and money by having your dictation available immediately—while the information is fresh in your mind—without having to wait or rely on a costly transcription service. This powerful solution lets you add custom words such as specific industry terminology, insert frequently used text or shortcut repetitive tasks by voice to work faster and smarter. With Dragon® Professional Individual you can complete documentation quickly and with greater detail and accuracy, improving your overall productivity and freeing time to contribute more to your work and further. Not a PC User? We have a Mac version just for you. 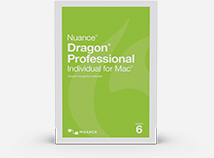 Dragon Professional Individual for Mac increases individual productivity at work by enabling fast, highly accurate dictation and transcription with exceptional customization to speed document creation. This easy-to-use solution lets you add custom words such as specific industry terminology, insert frequently used text or shortcut repetitive tasks by voice to work faster and smarter.